Elegant birds. The large Royal Tern is the size of a small gull. They live on our East Coast�ocean beaches, and nest on dry sand bars. Like all of our terns, they are highly migratory, and make their living diving for small fish. 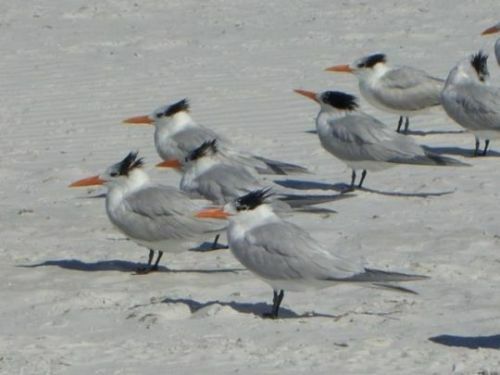 You can read about Royal Tern here.�Amateurs like me can easily confuse them with the Caspian Tern in the field (that is, on the beach). Humming birds (saw two--not clear if that is one pair, or the males from the two pairs that have nested here for several years--was poor light for seeing details). Saw black birds (not clear if it was blackbirds, grackles, or cowbirds) beating on a goose the other day. Can't imagine what the goose did to offend. But no Royal Terns at your place! Sounds like same as our migration pattern here. However, trees are full of May migrants: warblers, orioles, vireos, thrushes. Out here in the middle we get more "sea" birds than you might expect--seagulls among them but no terns that I have noticed. Oh, saw orioles at the "hummingbird" feeders. And I thnk the barn swallows are back.